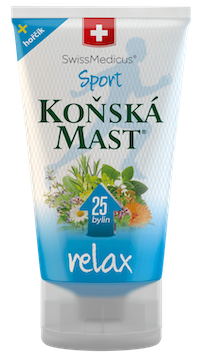 Horse balsam Sport Relax is a herbal balm specially developed for the needs of active athletes. Its cooling effect helps profound relaxing of the muscles, creates a feeling of relaxation and contributes to quicker regeneration. The balm includes herb extracts (such as comfrey, chestnut or juniper). Regular massages with Sport Relax strained and overstressed muscles. Magnesium complex with extracts of water lily and lotus helps prevent muscle cramps. After a sports performance, best after washing, apply the appropriate amount of relax on the required muscle areas and lightly massage in. Intended for external application only. Avoid contact with the eyes, mucosa and skin wounds. Keep out of the reach of children. Keep in a dry place at room temperature. Rare allergic reaction to some of the bio-active ingredients of the product cannot be ruled out. In such a case, it is necessary to stop application and seek medical advice if problems persist.